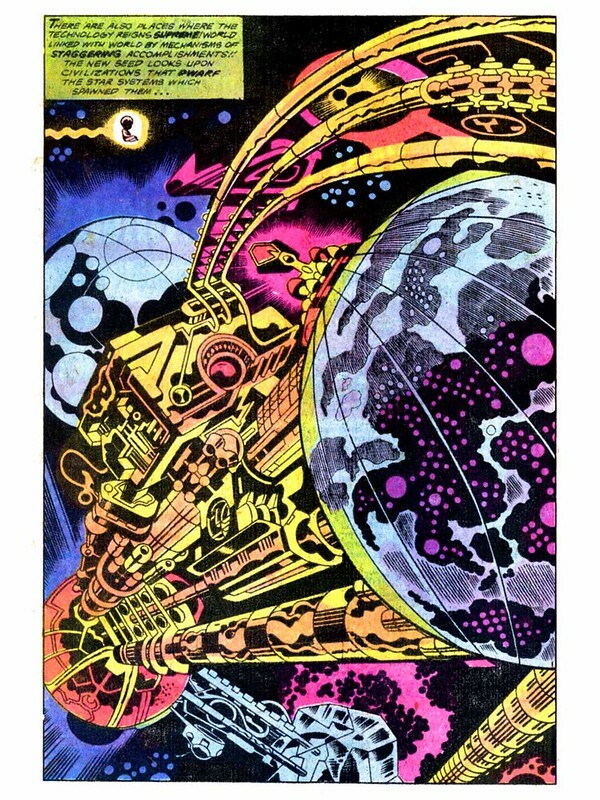 I made it a goal to re-read all of Jack Kirby's mid-seventies Marvel work this year. I hadn't liked it when originally published, but now I find them to filled with Kirby's wonderful imagination. 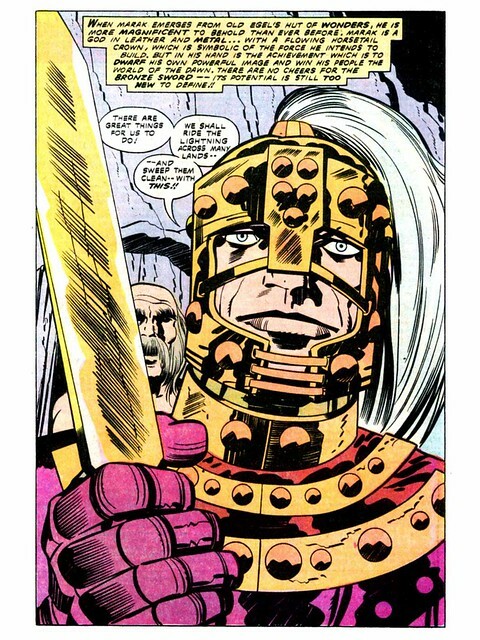 See my reviews of The Eternals and Captain America's Bicentennial Battles. Yesterday I wrote about 2001 the movie adaptation, here it's 2001 the color comic. The series I had the least hope for in terms of quality was the color comic series, 2001 A Space Odyssey. I collected these at the time but had no earthly memory at all, other than Machine Man appeared in issue 8 and that became a spin-off book. But I was wrong...this 2001 series is freaking great! 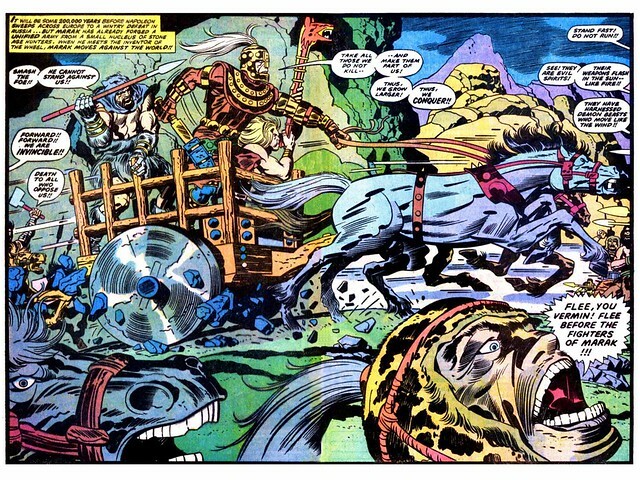 The artwork on many splash pages is just bonkers, as you can see above. This seems like a very experimental series for Kirby. The first issue seems like a replay of the main 2001 plot, with different characters. Many of the stories have the same ending as the movie: the Monolith appears and accelerates the aging process in someone to transform them into a Star-Child. But in issue #2, he does a short story about Vira the She-Demon. 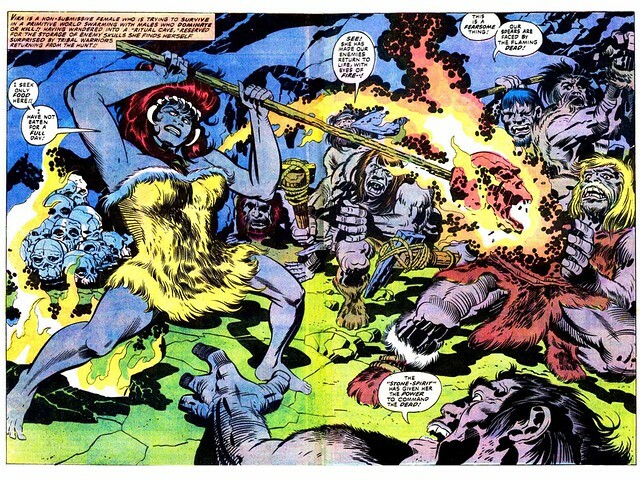 Half of the story is about Vira encountering the Monolith and learning how to use fear to subjugate the Neanderthals. The other half of the story is about Vera Gentry, an astronaut on Ganymede who also encounters the Monolith. Another story takes place later on, with a character called Marakwho encounters the Monolith and figures out how to make use of swords, shields, wheels, water barrels, and other things to make his army more successful. He's not the most admirable character. But we can see civilization slowly advancing. The series has no connection to Marvel. It has no plot that carries on between issues except for the occassional two-parter. It's like an anthology series that can take place in any time period. The only thing they have in common is an appearance by the Monolith. One issue could be set in the time of barbarians. Another was set in a future where people play virtual reality games based on superheroes. 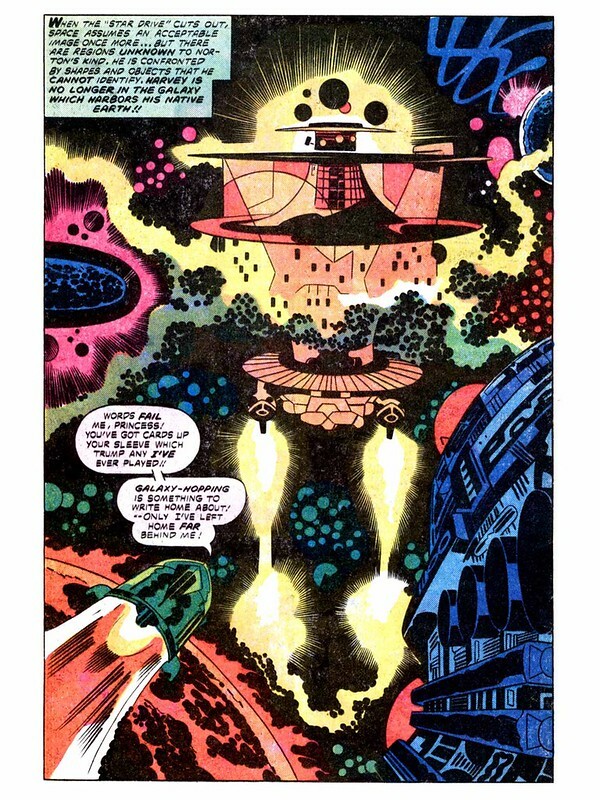 I suspect Kirby always wanted a free floating anthology and this gave him the vehicle to do it. It lasts for 7 issues in this anthology format, then Machine Man appears in issue 8 - where he was called X-51 at first. 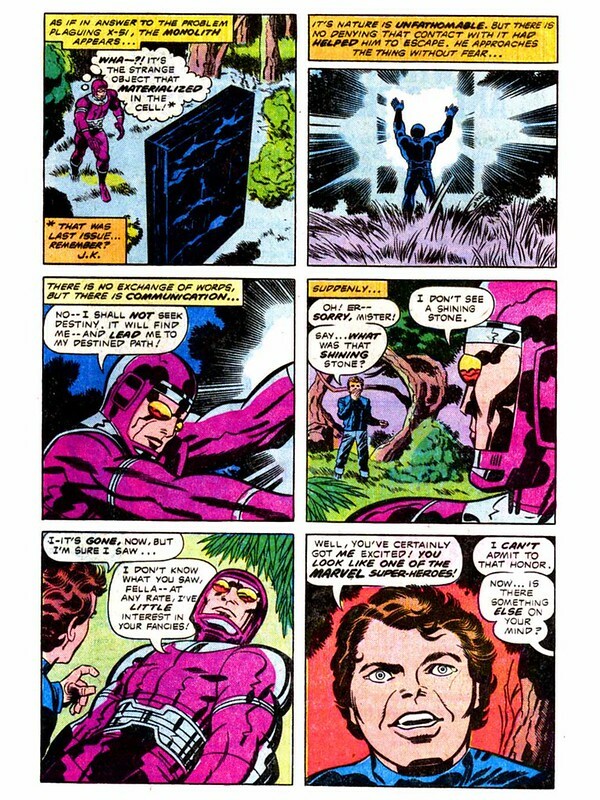 The connection to the 2001 stories is tenuous; Machine Man sees the Monolith at one point, which gives him some insight as to what to do next. But it launches a new series, one separate from the 2001 license and wholly owned by Marvel. I shall cover that over on Giant-Siz Marvel. 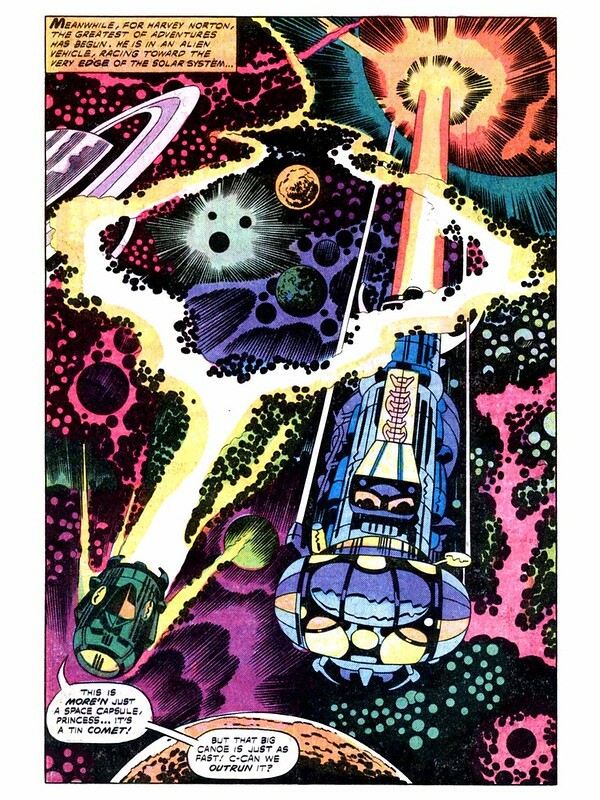 Nuff Said and Happy 100 Jack Kirby Birthday!